Looks like Jordan Brand will be releasing a few Jordan Retro 3's next year despite having released the Iconic Retro in 2010. The first colorway that we will see will be the Bright Crimson. This colorway has had its ups and downs ever since pictures started surfacing, some pictures made the shoe look great, other made it look like a easy Pass. We bring you more detailed images of the New Jordan 3 hopefully you can finally make up your mind whether this is be a cop for you. We see the 3 featuring a black leather upper ,with Bright Crimson accents an sockliner and adding on to the shoe will be purple Elephant print and sole. What do you think after these new pics? We first gave you a look at this mysterious Foamposite looking Barkley few days ago. Now we have detailed images, take a look at the Barkley Posite Max. Nike has whipped up a shoe to commemorate Barkley's famous words "I AM NOT A ROLE MODEL" which you can see written on the soles of both shoes. The shoe features a classic Eggplant colorway with CB logos on both the tongue and heel. How to you feel about this new Shoe from Nike. Will this be a cop for you? Next year is only getting better not only do many classics return but now we see Jordan Brand will be releasing a sample that we thought we would never see. 2013 Will see the release of the Jordan Retro 13 "Pantone" we first saw the pantone collection few years ago hoping that some colors would hit shelves we eventually gave up hope and saw many pairs leaked to the public. Now we finally have a chance to own a pair of the historic collection without dropping thousands. Your thoughts on this release? With the Season now in full effect Nike will be releasing the next signature shoe for many athletes including Kevin Durant. Last years huge success of the KD V has brought attention to the low price and Nike wouldn't be Nike unless they raised that price. KD has always maintain he wanted his shoes under $100, but looks like he has changed his mind. The upcoming KD V will retail $135 and GS sizes will also be available for $90. This special colorway you see will be releasing in limited amounts next month. Take a look at the DMV colorway and let us know what you think about the New KD. Surprising seeing another Jordan 3 colorway dropping in 2013 the year of the Jordan 5. After 2011 we thought would be a few years before we see Jordan brand bring back the iconic style but not so. 2013 Will see a few Jordan 3 colorways including this unusual colorway. This color features a greyish black upper with hints of Apple green and purple. Many have dubbed this pair the "Joker" because of its resemblance of color.Our sources tell us this pair will be limited to 5,000 pairs. Stay tuned for more info on this release in 2013. Not only will we see the Retro Jordan 1 High being suited with a OG style box, but as expected the 23rd Anniversary of the Retro 5 will bring a new box as well. This time Jordan Brand is going with the Cement Flip top seen on models 5-7. Everything stays pretty true to the OG style except of course the Nike Air which is replaced with Jumpman air. JB even went as far as to add OG size and price stickers, this is a nice touch to go along with that box. Those that remembers copping these OG boxes back in the day should appreciate the new boxes. Look for these boxes to come with Every retro 5 in 2013. Let us know what you think about the New/old box. Along with receiving the Nike Air on a few colorways the Jordan 1 High Retro for 2013 will also be getting that OG box feel. We see JB bring back the OG box ofter now and will continue to do so next year by throwing the shoe that started it all back in its original shell. Has the addition of the OG box changed your mind whether you are copping or not next year? Let us know. Stay tuned for more info on other OG boxes. After being the first to break the news of a new mysterious Foamposite dropping soon, more images started to surface over the past few weeks. 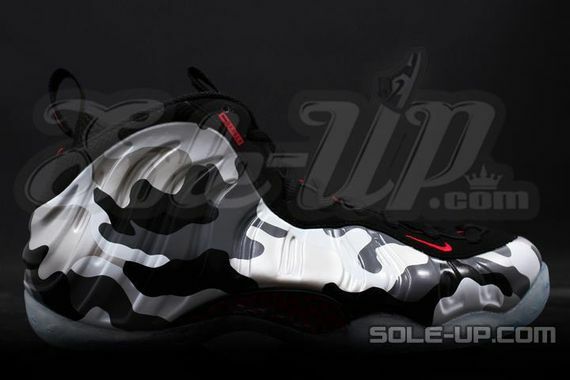 We now have our best images yet of this upcoming foamposite. What is more mysterious about this pair is its Air force type images and graphics, we are still not sure what kind or why these are releasing we have heard that they will only be released in very limited quantities. Take a look at the new photos and let us know what you think.